In 1932 when Albert J. Dremel invented the imitation of a small, handheld pneumatic die grinder, he had no idea how far his technology would evolve. The Dremel 8220 is one of the best cordless rotary tool kits on the market. Dremel started out with the 8 volt 8100 cordless series. It was nifty, but lacked the power for serious work. 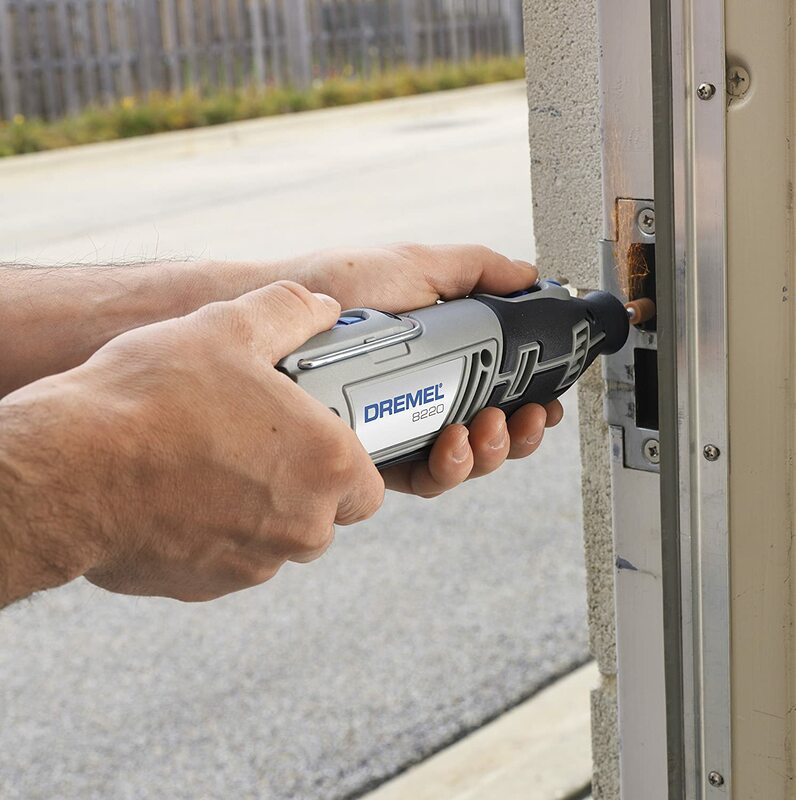 The Dremel 8200 was their first 12 volt cordless series, and it brought the power that had been missing from the 8100 series. Now, at ToolTally, I’m looking at the 8220 12v Max. (The “Max” refers to peak power.) This newer model offers greater battery life with a 33% longer run time. As a homeowner and mechanic, I’ve owned several Dremel tools. For me, it’s never a scenario where I’m sitting in one place and drilling for days on end. Often, I’m grabbing the kit and an extension cord to go whittle away on a door lock that isn’t latching properly or to cut off a rusted screw. I always use my Dremel on these one-off jobs. I probably spend more time plugging the tool in and packing it up then I do actually working on the task. 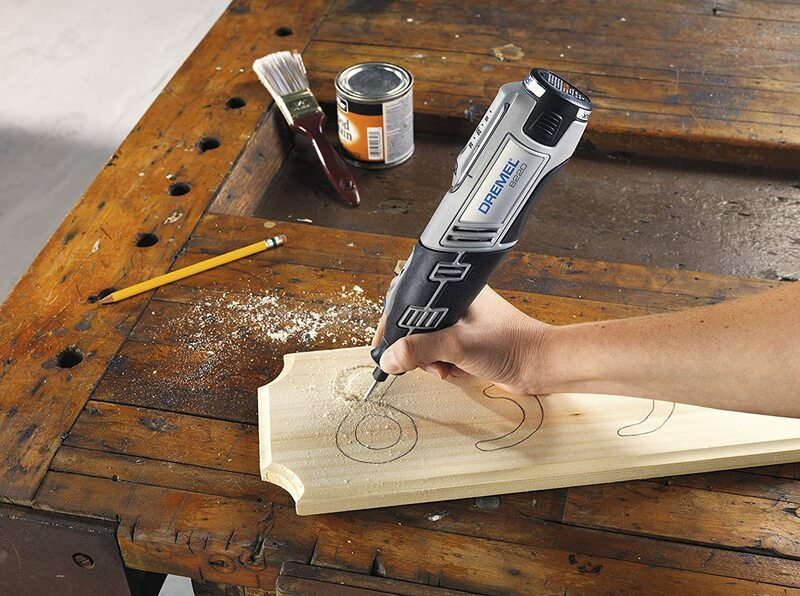 With a cordless Dremel, you don’t have to mess with that. All you do is pull it out of the case and get the job done. It’s a heavy-duty tool that is almost on par with the corded 3000 or 4000 series Dremels and ready to handle a wide range of projects. It’s also one of the most popular cordless tools that they sell. The first thing you’ll notice about the Dremel 8220 is its portable size (9” long by 3” wide). This tool fits easily into the palm of a single hand, and it’s small enough to pack into virtually any tool box or bag. Rated at 12 volt max, the Dremel 8220 has plenty of power. The high-performance motor responds well under load, making it ideal for all of those cutting and grinding tasks that you have planned. It sports a sliding speed control that gives the user the ability to select speeds ranging from 5,000-33,000 RPM for high speed . The variable speed control makes on-the-fly adjustments easy, too, making it simple to find just the right speed for the job, whether it’s making a precision cut into a piece of metal, or carefully sanding a small section of wood. A separate on/off switch lets you leave your speed settings unchanged. The battery used by the Dremel 8220 is a 12vmax lithium-ion battery technology with 1.5 amp hours that snaps into the base of the tool, providing up to 5 hours of continuous use, depending on the RPM selection and torque applied to the attachment being used. Conveniently, the battery has a charge time of only one hour. Here’s a little-known fact about the Dremel 8220 – at a full charge, it’s just as powerful as the corded version! This makes it great for jobs that aren’t easily completed with corded power tools. What’s more, you’re always aware of the battery life thanks to three easy-to-read LED lights located just above the speed selection slider. The Dremel 8220 Includes an integrated hanging hook that folds out from the base, making it easy to store and quick to access. One of the most useful features of the Dremel 8220 is its keyless chuck feature, allowing the user to quickly and easily make fast accessory changes using the ez twist nose cap. The magic is in the collet lock that slides up and down the top of the tool; it doubles as a lock and an attachment grasp. Clever! The grip on the Dremel 8220 is rubberized in all the right sections with the 360-degree grip zone, making it comfortable to hold. If you opt for the 2/28 kit, you’ll also get a collared bit that allows the use of an assortment of grinding and sawing discs. The beauty of this system is that if you apply too much force to the cut-off wheel during use, it will actually flex and accommodate for the pressure, a feature that you won’t find with fixed-position grinding and sawing discs. If you are needing it to mostly saw straight lines, check out the Dremel saws. For intricate projects that are best completed with the Dremel Flex Shaft (sold separately), the Dremel 8220 is compatible. The Dremel 8220 is also compatible with the Dremel Workstation. Worried about how loud this rotary tool is? Don’t be – ABEC-rated ball bearing construction makes this power tool remarkably quiet during operation, even at higher speeds. Lastly, every Dremel 8220 comes with an excellent two-year manufacturer warranty supported directly by Dremel. Warranty claims and product support can be obtained by calling (800) 437-3635. There are two versions of the Dremel 8220 available – the 1/28 and the 2/28. The Dremel 8220-1/28 includes the main power tool with a removable, rechargeable battery with charger, and a suite of dremel attachments including cutting wheels and one sanding drum and eight replacement sanding bands. The Dremel 8220-2/28 version has basically the same rotary tool accessories but also includes a carrying case and an extra battery, which means you’ll be less likely to run out of juice when you need it most. That said, extra battery packs are pretty easy to pickup. Conclusion: The Dremel 8220 brings the power of a corded drill with an added battery lifespan. For those who use thier Dremel “On the job” it is a no-brainer. For folks who mostly use their dremel at a stationary workstation, check out the corded Dremel.